I’m Becky Morales, an ESL and Spanish teacher and mom to five kiddos through adoption, foster, and birth. 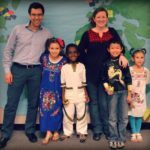 As our family grew, and because we have such a mixture of cultures in our house (U.S., Mexico, China, and Ethiopia), I began to look for simple ways to celebrate our heritages and to learn about the world. 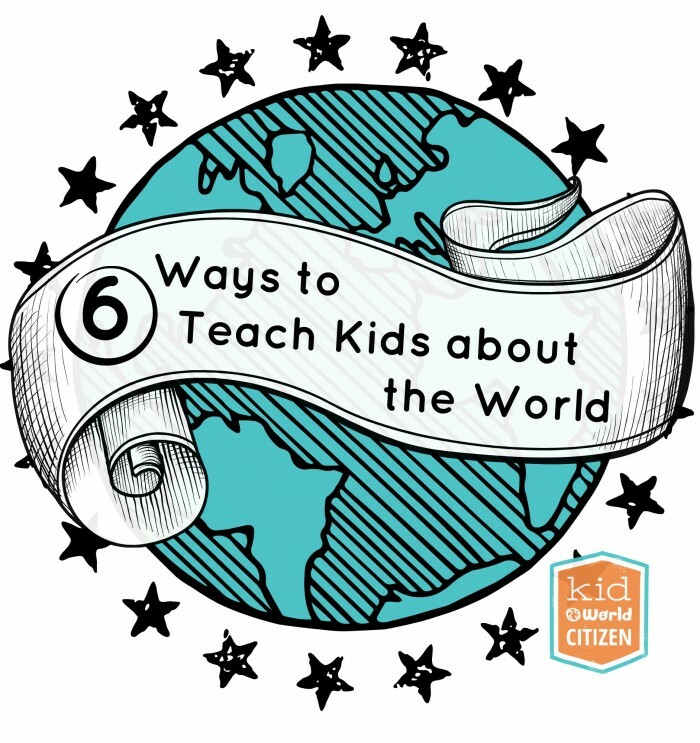 I founded Kid World Citizen initially to share ideas with other multicultural and adoptive families and my fellow ESL and Spanish teachers. It grew and grew, and now I am happy to share ideas there with families and teachers to help kids learn about all world cultures and geography. Here are six ways you can feature different countries and cultures in your classroom and open your students’ eyes to the world around them. 1. Read quality multicultural literature. join the Global Read Aloud. This worldwide book club uses Twitter, Skype, Edmodo, their wiki, email, regular mail, Kidblog, Tackk, and any other tools you can think of to make connections and discuss the book. There are several books to choose from, and kids in kindergarten through college can participate! 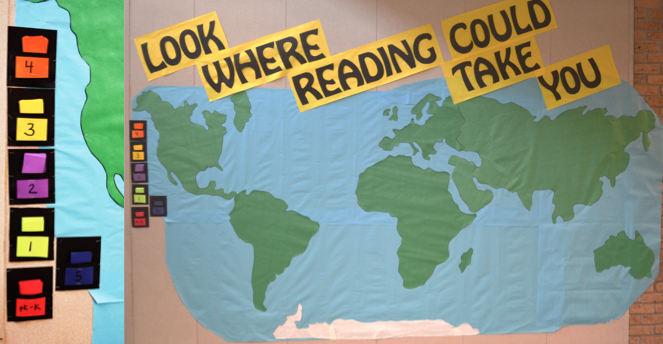 map the settings of the books you read and make sure you are covering all continents. incorporate multicultural folktales and fiction while also exploring culture in nonfiction books that feature kids’ real lives. read books that defy stereotypes by showing more than one side of the story. For example, when learning about communities, include books from other countries. Read about kids in urban, suburban, and rural South Africa so that kids realize Africa is not just a vast rural stretch of land with abundant wildlife (which does exist but is not the whole story). compare literature and learn about cultural values from Cinderella around the World, Gingerbread Stories around the World, or the “Trickster Tale” around the World. Start small: Research the holidays and find out the background of the celebration. There are great multicultural calendars available to help identify the world festivals. We have invited a mariachi band to our school, West African drummers, a lion dance troupe for Chinese New Year, and a wonderful Hanukkah storyteller. If you can’t invite visitors, then re-create a piece of the celebration in your class: Watch clips on youtube, talk to friends of the same culture to gather details, or read books to learn more. 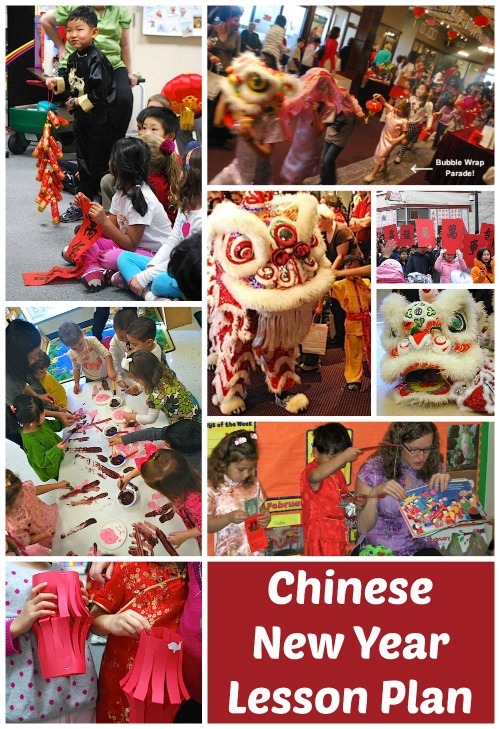 I have used a Chinese New Year lesson plan in multiple schools and libraries with ages pre-K to 3rd grade, and it only requires a couple of props and books. 3. Learn some new words. Language is such an important part of any culture. If your elementary schools is like ours, then there are no foreign language classes. First, choose a language to focus on for the year. Try to learn some conversational phrases: “Hello,” “How are you?” “What’s your name?” “Thank you, friend,” etc. Second, pick a time to spend five minutes on the word of the day. My children’s teachers have used calendar time to introduce numbers and days of the week in Spanish. Incorporate music and little songs sprinkled throughout the week. Teachers can get some CDs from the library to play for a musical brain break, and YouTube has tons of videos that introduce vocabulary in other languages for kids. Putumayo makes my favorite world music CDs for kids! Next, practice reading and writing the words you are learning as a way to incorporate emerging language skills. 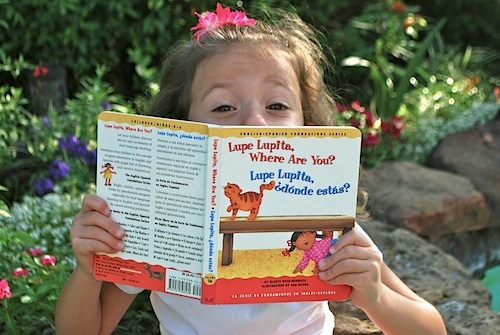 Finally, find some bilingual books at the library to share with your students that use language in context. 4. Connect with classes around the world. Use your computer to connect with classes around the world! If you’re on Twitter, try asking for participants with #globaled, #globalclassroom, #commentsforkids, or your grade level chat (#kinderchat, #1stchat, #2ndchat, #3rdchat, #4thchat, #5thchat, etc). I get requests all the time to help teachers find sister-schools, and the most common place to make a match is on Twitter, where teachers around the world can look up conversations by the appropriate hashtags. Once you make the match, you could Skype, tweet pictures, share what you’re learning via a blog post, or send letters to each other. You could also connect with a class using regular pen-and-paper pen pals. There are many places to look for pen pals for your class, but the safest and most popular site is ePals. 5. Add a global twist to existing lessons. Learn more about a country by using your five senses. Follow the route of snow melting in the mountains to the tributaries of major rivers, such as the Amazon, Yangtze, and Nile, and back to the sea. What differences and similarities do you find in families and communities? Look at schools, homes, children (how many, how they are treated, how long they live at home, what jobs they are expected to do around the house), and sports around the world. Include inspiring people from around the world (such as Wangari Maathai, the “Mother of the Trees” from Kenya) when you study biographies. Learn about where in the world our foods come from; investigate healthy multicultural cuisine. 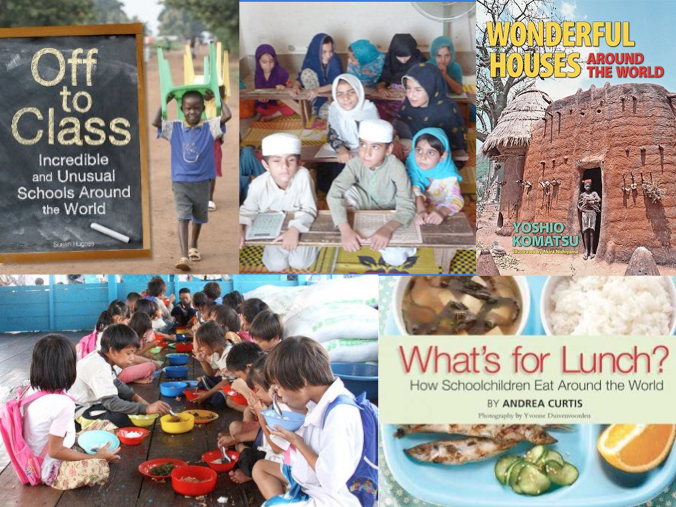 Look up slide shows of school lunches or breakfast around the world. Discover native flora, fauna, and habitats around the world; discuss hibernation (related to weather patterns) and migration routes with maps, such as this lesson on monarch butterflies. Teachers of art and music may serve as the greatest advocates for incorporating cultural lessons into existing curricula. Working in tandem with the art teacher in your school, students can create beautiful pieces of folk art or use techniques popular in certain parts of the world in art class, while deepening their learning about the specific culture back in their regular class. Look for Pinterest boards with loads of ideas (including those below) for creating multicultural art with your students. These are some of the many ways we can teach children about varying perspectives, while awakening them to the world outside their community. Global awareness is a 21st century skill that is critically important to success in today’s world and one that we can start to develop with children in elementary and preschool. I hope these activities give you some ideas to use in your classroom! Becky Morales is the founder of Kid World Citizen, where she shares fun multicultural and geography activities with teachers and parents. She is an ESL and Spanish teacher and speaks about global learning in workshops for schools. Becky is passionate about world cultures, world languages, and world travel. You can find more lessons and activities on her TeachersPayTeachers page. once. The kids climbed all over me, we really hit off. My guess is it's because I understood their sense of humor. But funny thing? Kids in Israel never say please. If they want a glass of milk, they walk up to you and say in Hebrew "Want milk." It's the funniest thing. And I actually had adult Israelis complain to me that I said "thank you" whenever they'd hand me something to eat. "Why do you DO that?"